Shoegazing (or shoegaze, initially known as "dream pop") is a subgenre of indie and alternative rock that emerged in the United Kingdom in the late 1980s. It is characterized by its ethereal-sounding mixture of obscured vocals, guitar distortion and effects, feedback, and overwhelming volume. The term "shoegazing" was coined by the British music press to ridicule the stage presence of a wave of neo-psychedelic groups who stood still during live performances in a detached, introspective, non-confrontational state with their heads down. This was because the heavy use of effects pedals meant the performers were often looking down at the readouts on their effects pedals during concerts. Most shoegaze bands drew from the glide guitar template set by My Bloody Valentine on their late 1980s EPs and 1988 album Isn't Anything. A loose label given to the shoegaze scene and other affiliated bands in London in the early 1990s was The Scene That Celebrates Itself. In the early 1990s, shoegaze groups were pushed aside by the American grunge movement and early Britpop acts such as Suede, forcing the relatively unknown bands to break up or reinvent their style altogether. In the 2000s, there was renewed interest in the genre among "Nu gaze" bands. "Soon", from the 1991 album Loveless by My Bloody Valentine, features a dance-oriented beat behind three tracks of Kevin Shields' "glide guitar". Shoegaze combines ethereal, swirling vocals with layers of distorted, bent, flanged guitars, creating a wash of sound where no instrument is distinguishable from another. Most bands drew from the music of My Bloody Valentine as a template for the genre. Co-founder Kevin Shields stated that the band's choice of pedals never included chorus, flanger or delay effects. His most notable effect was reverse digital reverb, sourced from a Yamaha SPX90 effects unit. Together with the vibrato manipulation and distortion, he created a technique known as "glide guitar". Shields used at least 30 effects pedals, most of which were distortion, graphic equalizers and tone controls. "Shoegazing" was coined to describe dream pop bands. It originated in a concert review in Sounds for the newly formed band Moose in which singer Russell Yates read lyrics taped to the floor throughout the gig. The term was picked up by NME, who used it as a reference to the tendency of the bands' guitarists to stare at their feet—or their effects pedals—while playing, seemingly deep in concentration. Melody Maker preferred calling it "The Scene That Celebrates Itself", referring to the habit that the bands had of attending gigs of other shoegaze bands, often in Camden, and often playing in each other's bands. According to AllMusic: "The shatteringly loud, droning neo-psychedelia the band performed was dubbed shoegaze by the British press because the bandmembers stared at the stage while they performed". I always thought Robert Smith, when he was in Siouxsie and the Banshees playing guitar [on the 1983's Nocturne live video], was the coolest as he just stood there and let the music flood out. That anti showmanship was perfect so I never really understood why people began to use "shoegaze" as a negative term. I think if Slowdive didn't stand there looking at what pedal was about to go on and off we'd have been shite. [...] I am glad we were static and concentrated on playing well. Now it is a positive term. The term was also considered pejorative, especially by a part of the English weekly music press who considered the movement as ineffectual, and it was disliked by many of the groups it purported to describe. Lush's singer Miki Berenyi explained: "Shoegazing was originally a slag-off term. My partner [K.J. "Moose" McKillop], who was the guitarist in Moose, claims that it was originally leveled at his band. Apparently the journo was referring to the bank of effects pedals he had strewn across the stage that he had to keep staring at in order to operate. And then it just became a generic term for all those bands that had a big, sweeping, effects-laden sound, but all stood resolutely still on stage.". Ride's singer Mark Gardener had another take on his group's static presentation: "We didn't want to use the stage as a platform for ego ... We presented ourselves as normal people, as a band who wanted their fans to think they could do that too." The most commonly cited precursors to shoegaze are the Cocteau Twins, the Jesus and Mary Chain, and My Bloody Valentine. Each band's music bridged the styles of garage rock, 1960s psychedelia and American indie bands like Dinosaur Jr. and Sonic Youth. Other artists that have been identified as direct influences on shoegaze include the Velvet Underground, Sonic Youth, Hüsker Dü and the Cure. Siouxsie and the Banshees was also a major influence, initially on Cocteau Twins. Slowdive named themselves after a Siouxsie and the Banshees song of the same name and took inspiration from the group at their beginnings. Lush, a shoegaze contemporary, were originally called "The Baby Machines", a line from a Siouxsie lyric. My Bloody Valentine emerged in the wake of their 1988 breakthrough (with the "You Made Me Realise" single and album Isn't Anything). The Trouser Press Guide to '90s Rock mentions that "A.R. Kane, the London duo ... (who dubbed their music 'dreampop') exerted a profound sonic influence on the legion of trippy shoegazer guitar bands that would emerge a few years later in the UK". Michael Azerrad's book Our Band Could Be Your Life cited an early 1990s Dinosaur Jr. tour of the United Kingdom as a key influence. Whereas contemporary alternative rock movements of the time period were extremely male-dominated (Britpop, grunge), My Bloody Valentine, Slowdive, Lush, the Cocteau Twins, and many other popular shoegaze acts had at least one prominent female musician who contributed key vocal elements and/or integral writing components to the music. Kevin Shields noted that there were as many women as men in the shoegaze community. A general description given to shoegaze and other affiliated bands in London in the early 1990s was The Scene That Celebrates Itself. The first stirrings of recognition came when indie writer Steve Lamacq referred to Ride in an NME review as "The House of Love with chainsaws". The shoegaze genre label was quite often misapplied. As key bands such as Slowdive, Chapterhouse and Ride emerged from the Thames Valley, Swervedriver found themselves labelled shoegazers on account of their own Thames Valley origins, despite their more pronounced Hüsker Dü-meets-Stooges stylings. The coining of the term "The Scene That Celebrates Itself" was in many ways the beginning of the end for the first wave of shoegazers. The bands became perceived by critics as over-privileged, self-indulgent and middle-class. This perception was in sharp contrast with both the bands who formed the wave of newly commercialized grunge music which was making its way across the Atlantic, as well as those bands who formed the foundation of Brit-pop, such as Pulp, Oasis, Blur and Suede. Britpop also offered intelligible lyrics, often about the trials and tribulations of working-class life; this was a stark contrast to the "vocals as an instrument" approach of the shoegazers, which often prized the melodic contribution of vocals over their lyrical depth. Lush's final album was an abrupt shift from shoegazing to Brit-pop, which alienated many fans; the 1996 suicide of their drummer signaled Lush's dissolution. Following a long gap from My Bloody Valentine since Loveless, aside from their 2008 reunion tour, the band released m b v in February 2013. Shields explained their silence by noting, "I never could be bothered to make another record unless I was really excited by it." Slowdive eventually morphed into the country-infused Mojave 3 and the dream pop Monster Movie, while other shoegaze bands either split or moved in other directions. The use of electronic dance and ambient elements by bands such as Slowdive and Seefeel paved the way for later developments in post-rock and electronica. Several former members of shoegaze bands later moved towards post-rock and the more electronica-based trip hop. Adam Franklin of Swervedriver released lo-fi albums under the moniker Toshack Highway. A resurgence of the genre began in the late 1990s (particularly in the United States) and the early 2000s, that helped usher in what is now referred to as the "nu gaze" era. Also various heavy metal acts were inspired by shoegaze, which contributed to the emergence of "post-metal" and "metalgaze" styles. Particularly in the mid-2000s, French black metal acts Alcest and Amesoeurs began incorporating shoegaze elements into their sound, pioneering the blackgaze genre. ^ a b c d e f g h "Explore: Shoegaze | AllMusic". 2011-02-17. Archived from the original on 2011-02-17. Retrieved 2016-08-09. ^ a b c d Reynolds, Simon (1 December 1991). "Pop View; 'Dream-Pop' Bands Define the Times in Britain". The New York Times. Retrieved 7 March 2010. ^ Richardson, Mark (11 May 2012). "My Bloody Valentine: Isn't Anything / Loveless / EPs 1988–1991". Pitchfork. Retrieved 17 April 2015. ^ "Noise Pop : Significant Albums, Artists and Songs, Most Viewed : AllMusic". web.archive.org. 2 June 2012. ^ a b Heller, Jason. "Where to start with the enigmatic music known as shoegaze". The A.V. Club. Retrieved 2016-08-09. "L'ethereal wave (et notamment les Cocteau Twins) a grandement influencé le shoegaze et la dream pop... L'ethereal wave s'est développée à partir du gothic rock, et tire ses origines principalement de la musique de Siouxsie and the Banshees (les Cocteau Twins s'en sont fortement inspirés, ce qui se ressent dans leur premier album Garlands, sorti en 1982). Le genre s'est développé surtout autour des années 1983-1984, avec l'émergence de trois formations majeures: Cocteau Twins, This Mortal Coil et Dead Can Dance... Les labels principaux promouvant le genre sont 4AD et Projekt Records." ^ "The 80 Best Albums of the 1980s : Music : Lists : Page 1 : Paste". Pastemagazine.com. Retrieved 2016-08-09. ^ "Space Rock : Allmusic". ^ Despres, Sean. "Whatever you do, don't call it 'chillwave'". Japan Times. Retrieved 8 November 2016. ^ a b c d e Rogers, Jude (27 July 2007). "Diamond gazers". guardian.co.uk. London: Guardian. Retrieved 13 May 2012. ^ DiPerna, Alan (1992). "Bloody Guy". Guitar World. Harris Publications (March 1992): 152. ^ Pareles, Jon (22 September 2008). 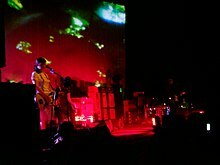 "Music – My Bloody Valentine: Reunited, Rediscovers the Love – Review". The New York Times. The New York Times Company. Retrieved 19 February 2012. ^ Larkin, Colin (1992). The Guinness Who's Who of Indie and New Wave Music. Square One. p. 188. ISBN 0-85112-579-4. ^ Gourlay, Dom (23 April 2009). "Shoegaze Week DIS Talks To Simon Scott About His Time In Slowdive". Drownedinsound. Retrieved 10 September 2015. ^ Exclaim! Sound of Confusion article on Shoegaze Archived January 22, 2009, at the Wayback Machine. Retrieved 22 September 2008. ^ Tyler, Kieron (17 January 2016). "Reissue CDs Weekly: Still in a Dream - A Story of Shoegaze". theartsdesk.com. Retrieved 17 December 2016. ^ Azerrad, Michael (2001). Our Band Could Be Your Life. Back Bay. pp. 366. ISBN 978-0-316-78753-6. ^ Lester, Paul (1992-09-12). "Whatever Happened to Shoegaze?" Melody Maker, p.6. Retrieved 12 April 2007 from Proquest Research Library. ^ "Kevin Shields: MBV Will "100%" Make Another Album". Pitchforkmedia.com. Retrieved 16 January 2007. ^ Stevens, Andrew (2007-07-11). "Leave Them All Behind: The 3:AM Guide to ‘Shoegaze’ and British Indie Music in the 1990s" 3:AM Magazine. Retrieved 17 March 2013. ^ Jacobs, Koen (4 September 2008). "Metal Gaze – From My Bloody Valentine To Nadja via SunnO)))". The Quietus. Retrieved 6 June 2012. ...the recent trend for combining metal’s sense of threat with the immersive idyll of shoegazing is undeniable, and only one aspect of the ongoing cross-pollination taking place in extreme music. For his part, r views the ‘metalgaze’ movement as less entropic than cyclical. ^ Burgin, Leah (5 December 2015). "Metalgaze gets confused with monotony on Pelican's latest disc". The Michigan Daily. University of Michigan. Retrieved 17 April 2012. ^ Zina, Natalie (2014-02-26). "The Translator Blackgaze". Exclaim.ca. Retrieved 2016-08-09. Wikimedia Commons has media related to Shoegazing.